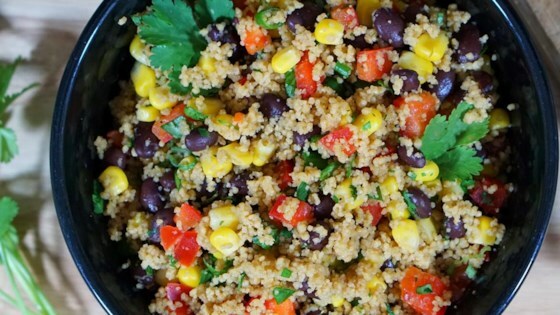 "This is a great salad for a buffet, with interesting textures and southwest flavors combined in one delicious salad. Leftovers store well refrigerated for several days." Bring chicken broth to a boil in a 2 quart or larger sauce pan and stir in the couscous. Cover the pot and remove from heat. Let stand for 5 minutes. In a large bowl, whisk together the olive oil, lime juice, vinegar and cumin. Add green onions, red pepper, cilantro, corn and beans and toss to coat. Fluff the couscous well, breaking up any chunks. Add to the bowl with the vegetables and mix well. Season with salt and pepper to taste and serve at once or refrigerate until ready to serve. See how to make a Southwest-style couscous salad with a tangy vinaigrette. Fabulous salad. Can't have enough of it. I used Taboulleh and chopped green pepper and it was fantastic. VERY GOOD!!! I added cucumber, tomato, white onion and instead of couscous i used bulgar(IT WAS GREAT) I love this salad and i will make it ALOT!!! I added some avocado to this and it was excellent!